Job description: This individual provides personal care and household management activities under the supervision of a professional nurse supervisor. Responsibilities include adherence to a care plan that may include helping the patient with personal hygiene; preparing meals; running errands; accompanying the patient to the physician’s office; light housekeeping; and helping the patient with speech, language or physical therapy programs. A CHHA must practice universal precautions and infection control techniques. Certification is issued when the individual has completed a 77-hour training course and has passed both the written and the practical competency exam. Job Description: Certified Home Health Aides with excellent parenting, teaching, and home management skills are needed to work with at-risk children and their families to provide direction, oversight, and guidance. HomeCare Options is seeking caring, compassionate and well trained CHHA’s to work with at-risk families referred by Child Welfare services. CHHA will assist with one on one interactions with at-risk children. If you are seeking a challenging and rewarding position where your knowledge, training, and guidance can help to make a difference for children in need, this job is for you. 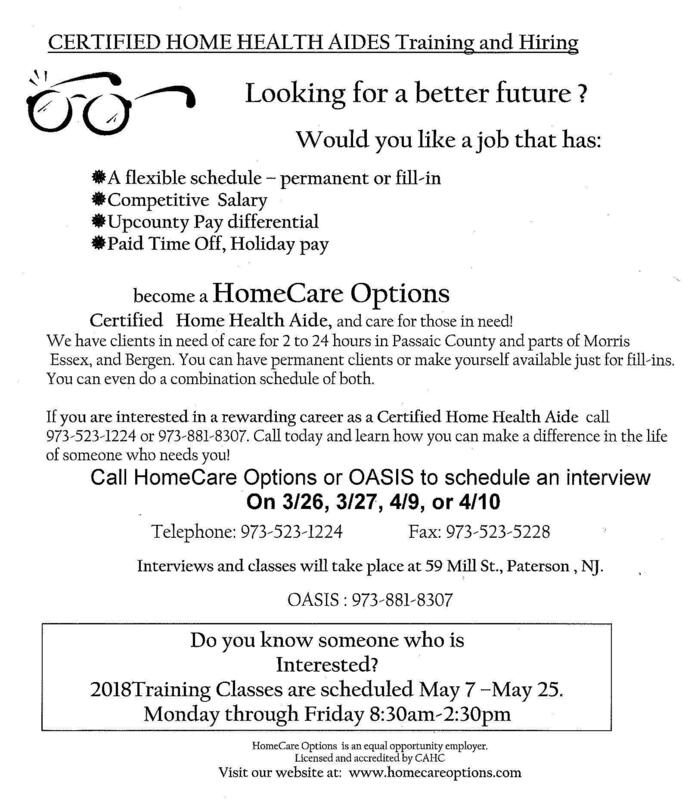 Please forward your resume and a letter of interest to Stefanie Winters, RN, Director of Services at HomeCare Options, P.O. Box 287, Totowa, NJ 07511-0287, or forward same via email to swinters@homecareoptions.com. All aides must have own transportation. Job Description: Home Care Aides who are willing to work as Housekeeping Aides are needed to provide housekeeping services to frail and elderly clients in their homes. Certification is not required. If available and interested, please contact Maria Motta at (973) 523-1224, at Ext. 234 or email your resume to mariamotta@homecareoptions.com.